This part is based on the blog entry http://ebookyaro.blogspot.jp/2012/10/kindle-paperwhite-epub3.html but adapted for Linux. drag and drop the file kokoro.txt into the lower part of the window. By doing this another window will pop up where you can edit the title, author, see the chapters etc. Note that you have to decide on the output format before-hand, it cannot be changed in the above windows. Convert the document by pressing the button “変換実行” (the one with the green tick mark). 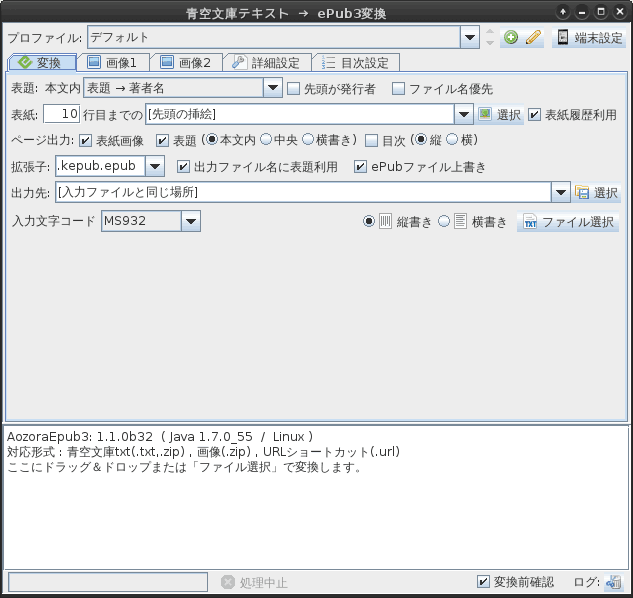 It will generate a file [夏目漱石] こころ.epub which is in epub3 format (or any other selected format). which will give you a file [夏目漱石] こころ.mobi which you can install onto your documents folder on your kindle. Be reminded that documents generated in this way will not appear as Books on your kindle, but as personal documents. Hello, thank you for the useful information. But please what do you mean by “convert it” in this sentence : “drag and drop the file kokoro.txt into the lower part of the window and convert it”. I cannot see any button for conversion. Thank you. Hi Nurit, thanks for your comment. I have updated the post with screenshots and better explanations. Hope that helps. Thanks, this article was extremely helpful! Another useful app that I came across while working on processing Japanese text files into mobi format was The Unarchiver, which automatically detects character encodings so that, if your zip file is Shift-JIS encoded, your filenames don’t get mangled when unzipping. I bought a kindle basic 7th generation yesterday and this post was extremely convenient. THank you! Although I still have the same problem. After converting the txt from aozora bunko to mobi using aozoraepub3 and kindlegen according to this instructions, http://trozky.web.fc2.com/how2ebk07.htm#ae3conf, I obtain a beautiful japanese format but I can`t use the dictionary, when I press the screen it selects longer sentences and doesn-t seem to be able to choose single kanji or words. I am using the free dictionary from kindle, what dictionary are you using?? Do you also struggle trying to use the dictionary? Hmmmm, I don’t own any of those newer Kindles, just and old first gen paperwhite. Can you send me the resulting mobi as well as the epub and I can try it out on both my Kindle as well as my Kobo. You need to download the zip file “773_ruby_5968.zip	“. I tried aozora kindoru but it gives you pdf, and the dictionary won’t work. Also AozoraEpub3 and kindlegen to obtain a dictionary compatible readable mobi, but I can’t choose a single kanji when reading, it underlines long sentences hard to reduce to single kanjis, impossible to read fluently. 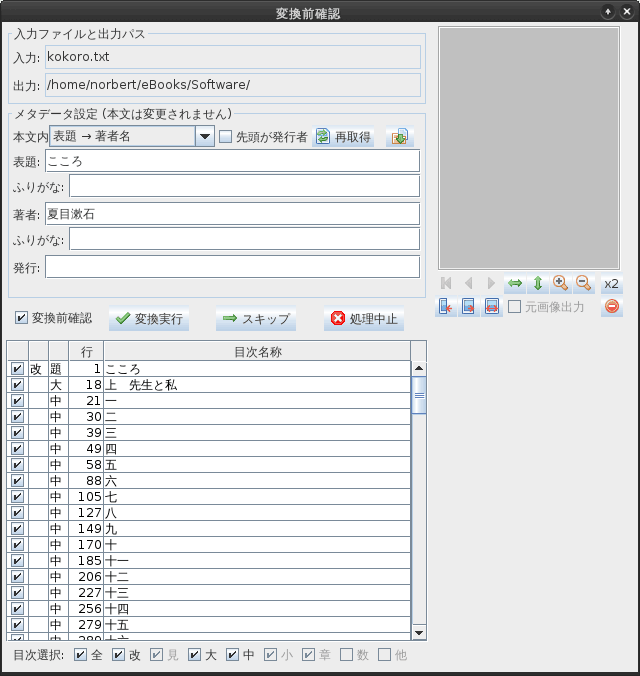 Natsume Souseki’s kokoro book is used in most blogs that were written years ago like in 2010 or 2013, it’s always used as an example to obtain compatible mobi files, but it is never said a thing about compatible dictionary mobi files from aozora. By the way, I made it to get a mobi file vertical up to down right to left mobi file, but can’t use the dictionary. If you want I can send it to you. Thank you so much for your quick answer.